At a panel discussion at Georgetown University entitled “The Changing World of International Development,” three development practitioners from leading organizations provided some insight into how their work has changed over the years. The speakers emphasized how local ownership has become central to the planning and implementation of their projects. Traditionally, the development field was focused on delivery of goods and services, especially in regions suffering humanitarian crises due to natural disasters or conflict. Over the years as the importance of local ownership of development projects became evident, the development landscape shifted to focus more on the provision of supplies and money to local actors to deploy as they saw fit. Both approaches have limitations: a mismatch between resources available and local needs, limited local capacity, delays that significantly diminish chances of success, and often corrupt actors at various points of delivery. These days, international development actors are focusing more on building local capacity and less on the delivery of goods and services. Building local capacity in service delivery, project management, governance, advocacy, and democratic institutions does not just meet the immediate needs of the community. It also increases the sustainability of development interventions beyond the life of a particular project. Increasing local capacity both ensures the success of the project and creates a multiplier effect as local organizations take over responsibility. CIPE’s model is locally oriented and and locally driven. Building local capacity has been central to the CIPE strategy for 30 years. Whether it’s through our national business agenda process or through legislative outreach programs that help educate local members of parliament or assembly on the economic and democratic policies and their potential impact, CIPE’s international work focuses on empowering local partners to become agents of change in their communities. The panelists also discussed the increasing number of actors who influence and participate in the development process, a shift in the form of deliverables from goods to services, and an increase in the speed at which changes occur. Technology, globalization, urbanization, climate change, demographic models, and local attitudes all influence how development actors must plan and how quickly they must respond. CIPE has continued to adapt to these changes while maintaining its locally-driven model of economic and democratic development. In Africa, CIPE partnered with Senegal’s largest and most representative business association, l’Union Nationale des Commercants et Industriels du Senegal (UNACOIS) to reform the national tax code, Le Code General des Impots du Senegal, which established a more uniform, equitable, and proportional tax code for the small and medium enterprise (SME) sector. UNACOIS also worked with the Ministries of Tax and Customs, Commerce and Industry and the Prime Minister to establish a mechanism for regular public private dialogue on issues related to the SME sector, economic development, and food security challenges. In order to determine the most important issues for reform, UNACOIS conduced regional dialogue sessions with the business community. The primary issues that emerged were the need to address the complex tax code and high tax rates, both of which were major causes of informality in the SME sector. With CIPE’s support and expertise, UNACOIS developed an evidence-based white paper with recommendations on tax reforms for the SME sector and conducted an advocacy strategy to implement these legislative changes. In Paraguay, the Development in Democracy Foundation (DENDE) identified the need for the first ever televised presidential candidate debate ahead of the 2013 elections. During the debate, the four leading candidates presented their policy agendas to the electorate, the creation of which was also a first for many politicians, and sparred on issues that DENDE identified as the most important through a nation-wide survey of 1,000 Paraguayans . The presidential debates ignited genuine policy dialogue in Paraguay for the first time, while informing over 3.4 million voters, 71 percent of whom said they were hearing the candidates’ policy proposals for the first time. Since 2008, CIPE’s work in Nigeria has focused on fostering a better business environment through regional public-private dialogue initiatives in seven states in the country. Nigeria’s federal system of governance has allowed CIPE and local partners to focus their work on regional and local level advocacy initiatives as they create the best opportunity for impact on reform. 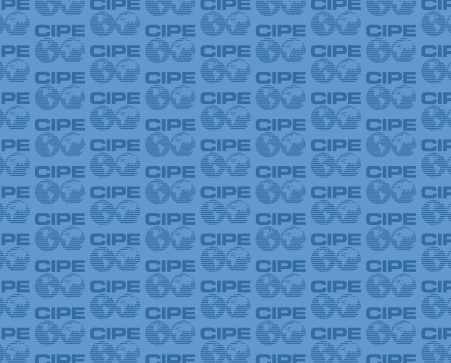 CIPE’s work has built the capacity of coalitions of professional and business associations at the sub-national level, which represent 130 business and trade associations and more than a million individual entrepreneurs. CIPE and local partners have addressed the need to educate parliamentarians through training sessions that provide officials with the knowledge and tools to legislate for a better business environment. These efforts have led to tangible impact results such as reducing multiple taxation on businesses in several states, institutionalizing public-private dialogue, and regular public hearings as part of the legislative process to gather input from civil society and the business community on proposed laws. The emphasis on local ownership of project initiatives is at the core of CIPE’s work and reflects the broader changes in the international development field, emphasized in a shift away from product delivery to a more sustainable model of development as discussed at the recent Georgetown event. CIPE aims to deliver the economic benefits of market reform and political freedoms of democratic governance adapted to local contexts to everyday citizens and entrepreneurs around the world. Teodora Mihaylova is Research Coordinator at CIPE. Laura Boyette is Program Coordinator for Latin America & the Caribbean at CIPE.